Combining analog and digital outputs with Android and Arduino. This tutorial will demonstrate the basic use of combined digital and analog outputs. The basic hardware is a hobby servo and two LEDs inside of an Android figure. The servo allows Andy Android to rotate 180 degrees. Next, upload the Arduino sketch to the microcontroller. The sketch uses the Microbridge implementation by Niels Brouwers. Microbridge uses Android Debug Bridge (ABD) forwarding over TCP, rather than the official Google Android ADK. 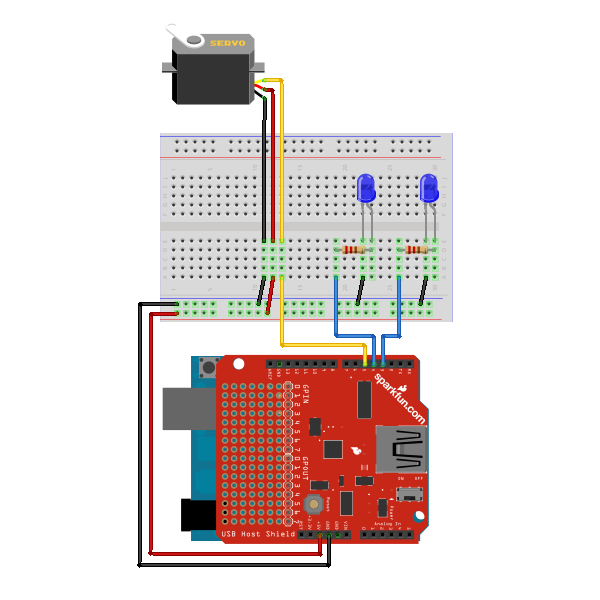 You can checkout the source for the Arduino sketch from Github, or just copy and paste the following into the Arduino IDE. // Init the ADB subsystem. // Poll the ADB subsystem. Finally upload the app to the device (or browse to this page on the device and download the apk above). Connect the Android device to the USB Host board/shield, and start up the app. hi thank alot for the tutorial. i try and compile the code with my arduino version 1.0 but it say i do not have the header file for adb. i tried add into arduino lib with adb header file but still having this error. do u mind sharing ur header file with me by email? Thanks Michael!!! I been trying to figure this one out for days!!! Glad to hear that fixed your error! hi michael, i had try what u mention but still not able to compile with same error occur. the below is the code i use can see if which part need edit.thanks alot alot for ur help . im able to resolve the problem alr. for phone part im using samsung GT-S5570(version 2.3.6) isit possible to run the app? Korea Hi Michael, I am a student. I’d like to try this project. Is there a way to where you got the android robot. hello michael .ı had added Microbridge library but stıll same arror. what must ı do ?can you help me ?